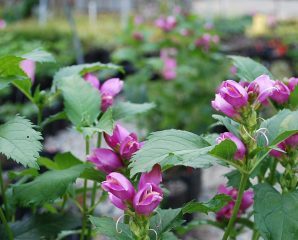 Dan’s Favorite Perennial – Turtlehead! Being a plant geek and the perennial grower at Planters’ Choice, I see many different plants around the nursery. We grow so many due to customer demands, and being plantsmen and women, we all request our own favorites because we really love them. For me, that’s Chelone (Turtlehead), one of my favorite genera of plants. Chelone glabra – features spikes of elegant, white flowers atop glossy, dark green foliage. 2-4’ high by 1-2’ wide. Zones 4-8. A favorite breeding site for Baltimore Checkerspot Butterfly. C. lyonii – has light pink colored flower spikes and beautiful dark-green glossy foliage. 2-3’ high by 1’ wide. Zones 4-7. Hummingbirds, butterflies, and bumblebees will have a field day on this plant. C. lyonii ‘Hot Lips’ – features rose-pink, elegant flower spikes, above dark green, glossy foliage. 2-3’ high by 1’ wide. Zones 4-7. Stems are red colored and new growth is bronze-green in color. C. obliqua ‘Tiny Tortuga’ppaf – Compact, low-maintenance plant with that typical wonderful Chelone foliage. Deep-pink flowers, as all other Chelone, remind me of Snapdragon flowers. 18-24” high by 12-16” wide. Zones 4-9. C. oblique ‘Rosea’ – an erect perennial with pink, snapdragon-like flowers and dark, glossy foliage. 2-3’ high by 12-18” wide. Zones 3-9. A favorite of hummingbirds and butterflies.